William Smith was born in Aberdeen, Scotland, the son of Elizabeth Duncan and Thomas Smith. In 1747 he left the University of Aberdeen before receiving his degree to teach, first in Scotland, and then in 1751 in the home of Josiah Martin on Long Island, New York. Smith’s 1753 essay A General Idea of the College of Mirania impressed Benjamin Franklin and the Rev. Richard Peters, leading to Smith’s appointment to teach natural philosophy and logic at the Academy of Philadelphia. After visiting the school in June 1753, Smith wrote A Poem on Visiting the Academy of Philadelphia. Smith’s credentials were made even stronger when he was ordained as a Church of England clergyman immediately before his 1754 election as a professor at the Academy. In 1755 the Academy was chartered as the College of Philadelphia and Smith was appointed provost, which position he held until 1779 when the College became the University of the State of Pennsylvania; he resumed his position in 1789, when the College was restored, until 1791 when it was merged with the University of the State of Pennsylvania and a new charter issued in the name of the University of Pennsylvania. During Smith’s first few years on the job, Franklin supported Smith’s reorganization of the school to include not only the Academy, but also the College of Philadelphia (now the University of Pennsylvania). Smith served as the College’s first provost, the equivalent of the modern post of college president. Smith and Franklin, however, did not always agree. In the College, Smith put more emphasis on classical education than Franklin had envisioned. In the realm of Pennsylvania politics, Franklin and Smith were almost immediately at odds with each other, in particular about whether the provincial military forces should be controlled popularly (by Franklin’s party) or by the proprietary Penn family. This public dispute led in 1756 to a power shift within Penn’s board of trustees, and the replacement of Franklin by Richard Peters as president. In 1758 Provost Smith was jailed briefly by the Pennsylvania provincial assembly for his printed attacks on the assembly’s military policy; during his imprisonment, Smith actually taught classes from jail. Smith was imprisoned along with William Moore, a leading Philadelphia Anglican as well as a judge, provincial assemblyman, and critic of Quaker pacifism. Moore, like Smith, had been arrested as a result of his attacks on the assembly’s military policy. Smith courted his jail mate’s daughter Rebecca Moore and married her that same year. Together Rebecca and William Smith would have seven children. During his long tenure as Penn’s first provost, Smith had a significant impact on the early formation of the college which would later be known as the University of Pennsylvania. Although Smith led Anglican services at the College and encouraged discussions of the Bible and religion outside of the classroom, he encouraged students of all faiths to attend and did not include official courses of religion in the curriculum. It was his view that students learned true religion from exposure to pure and truthful teaching. Readings focused on ethics and on deist views of the universe authored by a variety of authors. The quality of Smith’s mind was widely recognized. He received honorary D.D. degrees from Oxford and Aberdeen in 1759 and from Dublin in 1763. In 1768 he was elected a member of the American Philosophical Society. During the Stamp Act crisis and the early years of the American Revolution, Smith favored the broadening of colonial liberties, but decried the tendency to turbulence and upheaval. His printed essays called for caution grounded in colonial self-interest. Because Pennsylvania patriots suspected Smith of Loyalist sympathies, the new state government did not name him either as a trustee or the head of the University of the State of Pennsylvania when they created this institution in 1779. Instead this new institution was headed by John Ewing. Smith remained provost of a diminished College of Philadelphia until 1791 when the College was united with the University of the State of Pennsylvania to form the University of Pennsylvania. During the 1780s, Smith moved to Maryland. Here he founded Washington College as a nondenominational college with a curriculum similar to the courses he had instituted at the College of Philadelphia. In 1785 he worked on the American prayerbook. 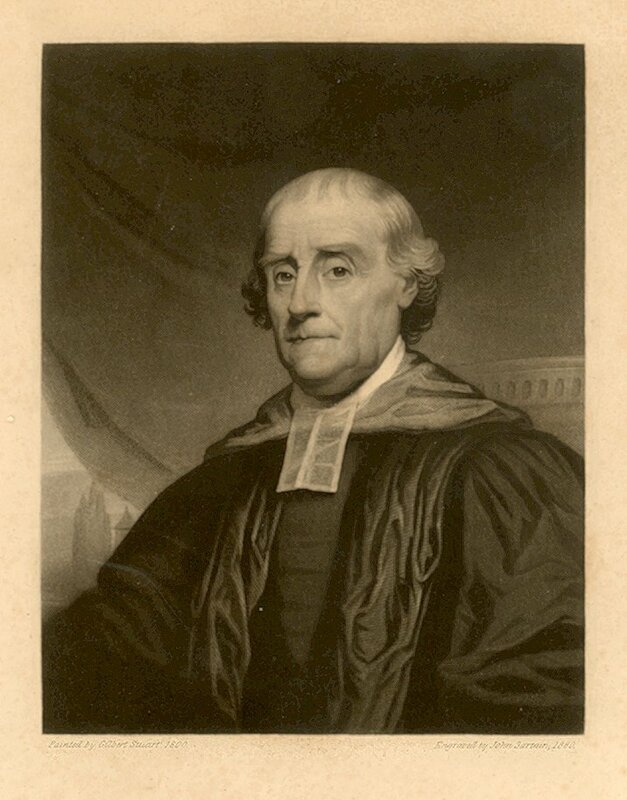 Long involved in ecclesiastical disputes, especially the controversy over whether or not to appoint an American bishop, Smith presided over the 1780 convention that created the new diocese of Maryland. He was elected, but never consecrated as Maryland’s first bishop. Two of Smith’s sons attended the Academy and then the College of Philadelphia: William Moore Smith (1759-1821), A.B. 1775, and Thomas Duncan Smith (1760-1789), A.B. 1776.